Konishi Hirosada (ca 1810 - 1864) Kanadehon Chushingura including Nakamura Utaemon IV as Oboshi Yuranosuke, 1851. Deluxe Chuban Triptych. A stunning example of a Hirosada night scene from the well known story of the revenge of the 47 Ronin. The print is an outstanding example of one of Hirosada’s classic late nocturne triptychs and is superbly printed with dense, rich colours, embossing and metallic inks. The performance at the Naka Theatre in 1851 included some of the great stars of the kabuki stage, including: left: Mimasu Gennosuke II as Yazamu Jutaro and Nakamura Sagisuke as Owashi Bungo; centre: Mimasu Tanin V as Kodera Junai, Nakamura Sennosuke as Oboshi Rikiya and Mimasu Baisha as Hara Goemon; and right: Nakamura Utaemon IV as Oboshi Yuranosuke. 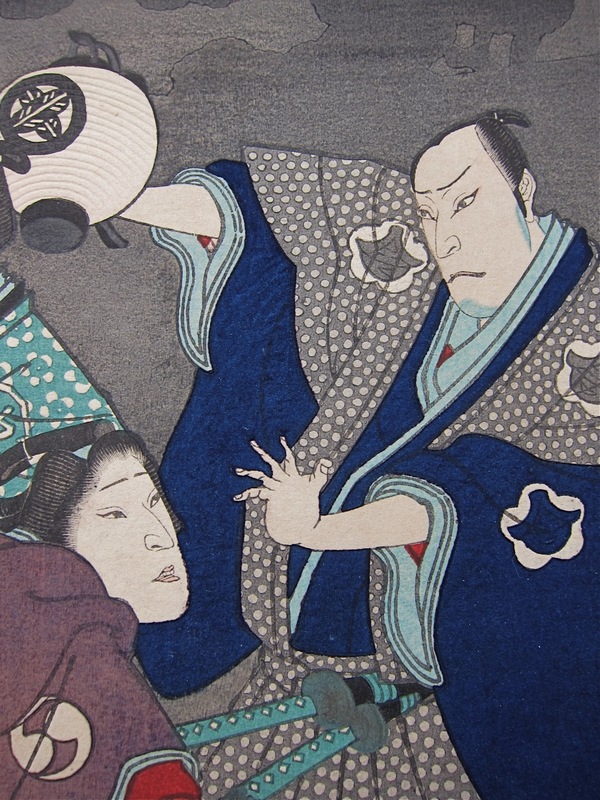 In this print we see again the familiar face of Nakamura Utaemon IV. In both prints he plays the character of Oboshi Yuranosuke, the leading force behind the epic story of revenge in the Chushingura - the loyalty of the 47 Ronin. The subject was especially popular with Edo print artists and remains emblematic in Japan to this day. It is likely that both prints commemorate (or advertise) the same production and are related pieces. Particularly impressive is the wonderful massing of the crowded figures on the left hand side and the isolation of Yuranosuke on the right, the movement of the figures echoed by the rhythm of the lanterns held aloft. Three sheets attached and backed on album backing. Colour, impression and condition are all fine.